The Texas 4000 pitch — “Do you want to bike from Austin to Alaska?” — got Alexander Zwaan’s attention. “I said, ‘That sounds crazy,’ but it got me interested,” said Zwaan, a native San Antonian currently studying international relations and global studies at the University of Texas at Austin. He was intrigued enough to look into the program. And he liked the sound of it so much that he signed up. He will be a team leader for next summer’s 70-day ride. Those selected to take part in the Texas 4000 make a hefty commitment. The physical challenges of the ride itself are just part of it. 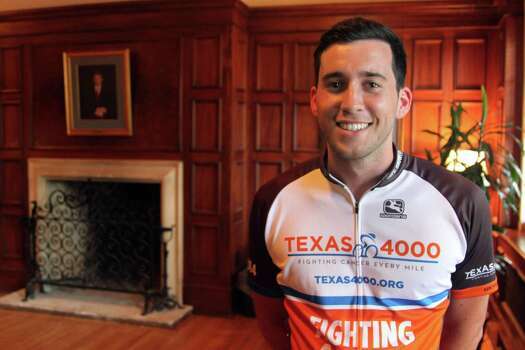 Riders — all of whom are UT-Austin students — commit to an 18-month program, including the ride. They agree to do 50 hours of volunteer work in the community and to raise at least $4,500, which goes toward the cost of the program and to grants for cancer research. They also take part in an intense professional development program, in which they learn about grass-roots fundraising, team building, media relations and volunteerism, among other things. And they do cancer prevention programs during stops on the ride. A total of 88 riders are taking part in next summer’s ride. They are divided into three teams, each taking a different route. Zwaan is a team leader heading the group slated to ride through the Ozarks. Though he hasn’t been a serious cyclist in the past, he feels confident that he’s up to the ride. And he’s looking forward to all of it. And, if he goes along with his mom’s plans for him, he’ll have plenty of documentation of whatever happens. Karen Zwaan said she plans to give him a GoPro camera so that he can shoot video on the road. She and the rest of his family plan to meet him in Anchorage at the end of the ride.